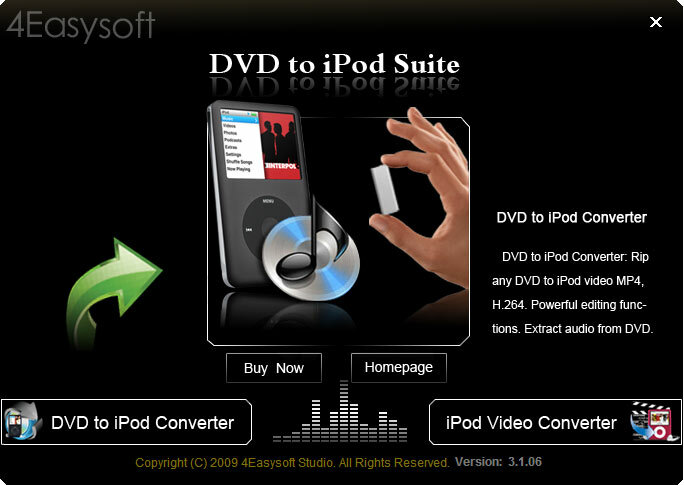 4Easysoft DVD to iPod Suite is a powerful ipod converter to convert DVD and video to ipod MP4, MOV, etc. This software has the capability to editing your favorite video files, , including trim, crop, merge, effect, watermark, take snapshot, etc. 4Easysoft DVD to iPod Suite has perfect fuctions and powerful editing features. The software can convert DVD and video files to iPod directly. And it is available for you to optimize the output video, such as trimming, cropping, merging, watermarking, and take snapshot, etc. 4Easysoft DVD to iPod Suite also has the advantage of simple to operation and easy to use. Key functions: 1.Convert DVD to iPod MP4, H.264, MOV and audio Using DVD to iPod Converter, you can convert any DVD to MPEG-4 (.mp4), H.264 (.mp4), MOV, M4V video and MP3, AAC audio for iPod, iPhone, Apple TV and others. 2.Rip video to iPod video and audio You can convert any formats, including MPG, MPEG, MPEG 2, VOB, DAT, MP4, M4V, TS, RM, RMVB, WMV, ASF, MKV, AVI, 3GP, 3G2, FLV, ect. with the part of iPod Video Converter. It can also extract audio from video and convert audio formats to MP3, AAC, AIFF, M4A, WAV audio formats. 3.Compatible with all iPod/iPhone models The ripped and converted files can be played on your iPod, iPod Touch, iPod Touch 2, iPod Nano, iPod Nano 4, iPod Classic, iPhone, iPhone 3G, Apple TV, PSP, PS3. 4.Adjust output video More items are available for you to adjust: Brightness, Contrast, Saturation and volume. For your interlaced DVD movie or video file, the additional ?Checking Deinterlacing? function can convert interlaced video to the progressive to avoid mosaic. 5.Capture your favorite picture Capture your favorite picture while you preview your DVD or video files, then the image can be saved automatically in the default folder. 6.Obtain any time-length DVD or video clips With this converter suite tool, you can trim any part from your DVD disk or video files exactly set the beginning and ending time or casually drag the slider bar. All to iPod Video Converter can convert almost all kinds of video files, for instance, DivX, XviD, MOV, rm, rmvb, MPG, MPEG, VOB, VCD, DVD, SVCD, AVI to Apple iPod iPhone MP4 files. Support DVD Ripper and YouTube Ripper. CXBSoft RM Video Converter an Excellent-Simple RM Converter which able to Extremely-Fast convert your favorite video files in all formats into RM(RealMedia). including convert MPEG to RM, AVI to RM, FLV, MP4, 3GP, WMV, AVC, MOV, XviD, MKV to RM, etc. Rip Blu-ray is the best Blu-ray ripper for guest users, even if you don't know how to rip Blu-ray, you can easily rip Blu-ray to any SD/HD video formats. 4Easysoft Video to MP3 Converter, a stunning Video to MP3 Converter software, can convert various kinds of videos to MP3 including YouTube, AVI, WMV, MPEG, ASF, MP4 to MP3, etc. Then you can put the fantastic music on Zune, iPod shuffle. Cool Free All Video to WMV Converter is a powerful WMV video converting tool which is easy to convert most popular video files to WMV video. Its standards-based encoding algorithm ensures that the output video has the best quality. 4Easysoft FLV to AMV Converter can convert FLV to AMV/MTV/MP3, etc. With very efficient codes, this FLV to AMV software ensures the smooth playback of the converted files on your MP4 player, S1 MP3 player. EasyDVD Blu-ray Ripper is the best Blu-ray ripper for guest users, even if you don't know how to rip Blu-ray, you can easily rip Blu-ray to any SD/HD video formats. This site does not contain serial number, crack, keygen 4Easysoft DVD to iPod Suite serial number : serial number is the simplest type of crack. A serial number(cdkey,product key,etc) is register the program as you may already know. a crack or keygen may contain harmful software. If you cannot find the exact version you want, just give it a try. for more information read .nfo/.txt/.diz file include in zipped file.